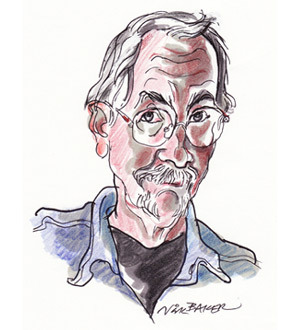 Nick has worked as a freelance cartoonist and humorous illustrator for over forty years. He now draws fewer cartoons and produces drawings, paintings and monotype prints. On-the-spot drawings: of places, people and events. London and UK, some Europe. Nicaragua 1988; Hong Kong 1996; Orissa, India 2001-2. Published in The Oldie and national newspapers. Nick has a large ‘on-the-spot’ archive, drawn for publication. Drawings: from memory and imagination. Paintings: also from memory, imagination and from drawings. Monotype prints: one-off prints in colour and black and white. Cartoon drawings: published in Punch, Private Eye, The Spectator, The Oldie, The Financial Times and national press and magazines. Poetry: He has been writing poetry for over twenty years and has been published in various poetry magazines. The Claude Andre Gallery, Brussels 1998. If you would like to see more work or discuss exhibiting, publishing or buying his work, please contact Nick.